This still has quite a ways to go, but I’m happy with how it’s progressing. I’ve sewn together the strips; now, I need to dye it (Aztec Gold), and then line and assemble the pouch. I really, really like the knots and birds. The name part is a little… intense. You can certainly read it from across the room. I may do some beadwork around the edges or something, to lighten this up a little. It should be better once it’s gold, too. 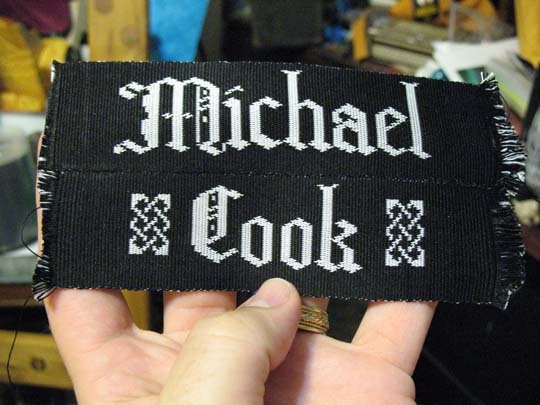 It’ll have a strap, eventually – I’m considering a strapwork design, or maybe an Egyptian Diagonals design. I’ve been having some serious fun with that stuff. Stunning! 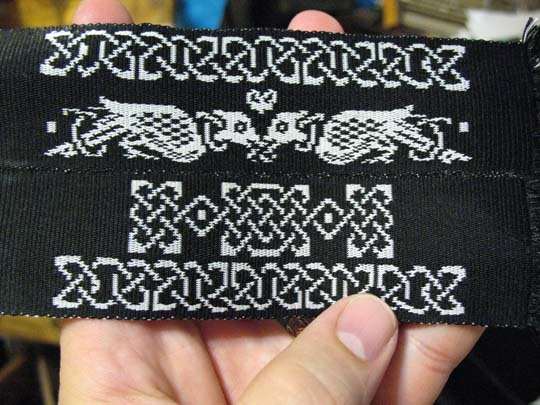 I’m picturing it with a 7-loop round fingerloop braid in matching thread covering the edges. I’m about to embark on my first piece of tablet-woven writing… Not quite sure what to do so I might make it a sampler. One of these days, I’ll be (almost) as good as you! Inspiring as always. The birds are very nice!